Posted: Sat Jul 19, 08 7:47 am Post subject: Ugh! Ugh! I was sent Beretta's new e-catalogue this morning, and in it is a prominent advert for this 'special edition' firearm. Unless there's a new or previously untapped market consisting of more than ordinarily degenerate French aristocrats, and Wild West saloon owners, I wonder who they expect to purchase the revolting object. Awww - look at da pwetty gun..
See, if Mel Gibson had one of those, lethal weapon would have been a completely different film. I thought it was more disturbing than funny! 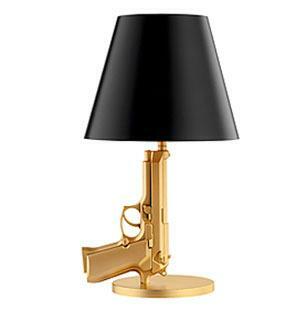 It could be converted to an excellent cigarette lighter ? I have an odd sense of humor - what can I say ? It'd be one way of stopping smoking. Posted: Sat Jul 19, 08 11:44 am Post subject: Re: Ugh! Ugh! does it work full of mud ? 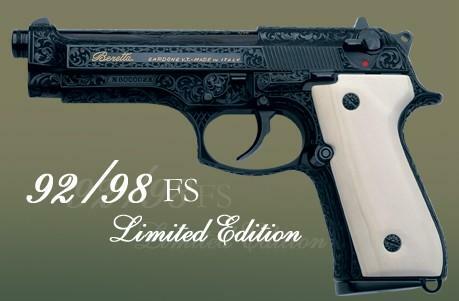 The Beretta 92 probably would - it's one of the best pistols ever made. But pimped like that? Very dodgy!